Pant conceded a staggering 23 byes. Rishabh Pant’s foray into international cricket was an audacious one as he got off the mark in the format with a six in his very second delivery of the third Test at Trent Bridge in Nottingham. During his knock, he showed an unruffled temperament and notched 24 hard fought runs. Thereafter, the Uttarakhand-born cricketer pouched seven catches in the match to capture the imaginations of the supporters. Albeit, he couldn’t deliver with the willow in the second innings, he was showered with praises from the cricketing fraternity. The 20-year-old performed well enough to ensure that he finds a place in the eleven for the fourth and penultimate Test of the series at The Ageas Bowl in Southampton. Only one day has gone by in the contest and the match has already turned out to be a disaster for Rishabh Pant. He had a difficult time with the wicketkeeping gloves. England scored 246 runs and almost ten percent of those runs were scored off byes. To be precise, Pant conceded a staggering 23 byes. The youngster mostly missed out on collecting the balls down the leg side. He made valiant attempts with full-length dives, but unfortunately couldn’t latch on to the deliveries. Moreover, he dropped Jos Buttler when the batsman unsuccessfully tried to leave the ball off Mohammed Shami. He misjudged the ball and grassed the catch. To Pant’s relief, the missed opportunity didn’t cost India much as the swashbuckling English batsman could only manage 21 runs in 24 balls and was nipped out by Shami itself. Pant’s only moment of joy in England’s first innings came when he took Jonny Bairstow’s catch off fast bowler Jasprit Bumrah. In the meantime, Twitterati wasn’t satisfied with Pant’s indifferent performance behind the wickets. Some even reckon that Wriddhiman Saha, who is recovering from a shoulder injury, would easily replace him if he doesn’t stand up to the task. I bet none of them had watched the match live..
Tough day behind the stumps for Rishabh Pant, but he has kept much better than the scorecard says. Return back @Wriddhipops as soon as possible. 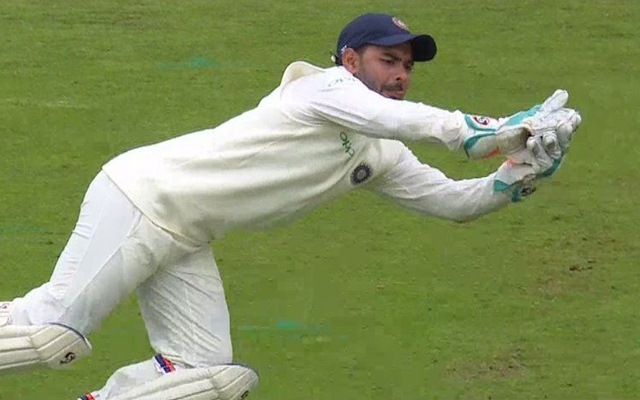 The technique of Rishabh pant is totally waste in terms of wicket keeping. Saha continued to save more runs behind the stumps but rishabh not! That is the successful point that saha have ..
Rishabh Pant proving you should always have the best WicketKeeper in the team!! !